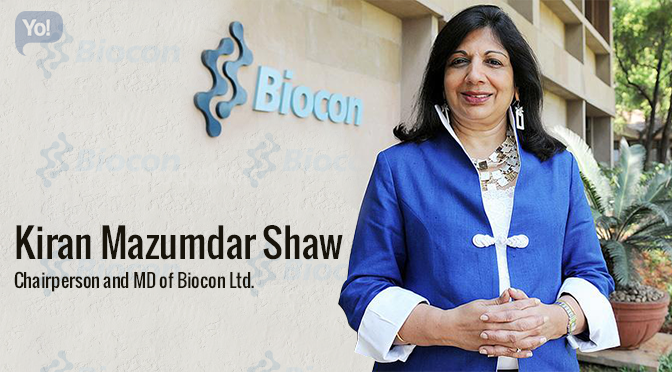 Born on 23rd March 1953; Kiran Mazumdar-Shaw is the Chairman and Managing Director of Biocon Limited – India’s largest listed biotechnology company based in Bangalore and is also the present chairperson of IIM-Bangalore. As of September 2014; with a net worth of $1.2 Billion, she is India’s #81st richest person and world’s #92nd most powerful Women. Other than that; she is an honorary member of the Prime Minister’s Council on Trade & Industry in India and the US-India CEO Forum. Being a member of the Governing Council of Ministry of the Corporate Affairs, National Foundation for Corporate Governance, Government of India and an active member of the Union Commerce Ministry-instituted committee to advise the government on India’s export promotion strategy; Kiran plays highly important roles for the betterment of the nation as a whole. Personally; Kiran married to Scotsman John, Shaw holds a soft corner for art and has huge collections of paintings and other art works. She is also fond of writing and has written several books like “Ale & Arty”- the story of Beer. Born to a Gujarati family in Bangalore; Kiran completed her schooling and college from Bangalore’s Bishop Cotton Girl’s High School and Mount Carmel College, respectively. She graduated in biology and zoology from Bangalore University with an aim to get into medical school, but unfortunately did not get a scholarship. Her father – Rasendra Mazumdar, the head brewmaster at United Breweries suggested her to study fermentation science, and train to become a brewmaster. Without many options in hand, in 1974 Mazumdar entered the Ballarat College of Advanced Education in Australia to study Malting & Brewing and turned out to be the only woman who had enrolled in the brewing course. After earning her degree of Master Brewer in 1975, she began working as a trainee brewer in Carlton and United Breweries, Melbourne and as a trainee maltster at Barrett Brothers and Burston, Australia. Domestically, she also worked as a technical consultant at Jupiter Breweries Limited, Calcutta and as a technical manager at Standard Maltings Corporation, Baroda; from 1975 to 1977! But when she decided to settle down, she figured that there weren’t any options as a master brewer for a woman in India, apparently because “It was a man’s job,” hence, she began to search for jobs abroad and was offered a position in Scotland. Just before Kiran was about to make the move to Scotland, she met Leslie Auchincloss – founder of Biocon Biochemicals Limited, of Cork, Ireland; and her journey to entrepreneurial success began! Auchincloss’s Biocon used to produce enzymes for its utilization in the brewing, food-packaging and textile industries. During that time, Auchincloss had intentions to establish its base in India and was looking for an Indian entrepreneur for a subsidiary. He approached her because Indian FDI laws were very strict back then and restricted foreign ownership to 30% of the company. And although it was a joint venture; but 70% of the company belonged to Kiran Mazumdar. Kiran took up the job but under one condition that she would be guaranteed a brewmaster’s position similar to the one she was giving up, if she did not wish to continue after six months. To learn the business in detail, for a brief period she worked as a Trainee Manager at Biocon Biochemicals Limited, of Cork, Ireland. Soon after returning to India, Kiran with a seed capital of Rs. 10,000 (around 4 lakhs today) started Biocon India in 1978, in the garage of her rented house in Bangalore. In the beginning days, she faced many challenges like credibility due to her youth, gender & her untested business model; Funding problems because no bank wanted to lend her the money without a guarantor or guarantee and recruitment was one big issue for her too because nobody wanted to work for a startup, as a matter of fact, her first employee was a retired garage mechanic. Other than that; she faced quite a few frustrating technological challenges as well such as unstable infrastructure, power, poor quality water, unhygienic labs, low-quality research equipment, workers without advanced scientific skills, etc! But she didn’t give up! Rather; overcoming all the challenges, within a year of its inception, Biocon India became the first company in India to be able to manufacture enzymes and export them to the United States and Europe. Whatever the company earned in the first year was used to buy a 20-acre property, with a dream of future expansion. Till the year 1983, Biocon followed the same protocols as guided by the parent company and also sold to companies with similar backgrounds. Soon after that; Kiran transformed Biocon – an industrial enzymes manufacturing company to a fully integrated bio-pharmaceutical company, a company with a well-balanced business portfolio of products and a research focus on diabetes, oncology and auto-immune diseases. And eventually, she also launched two subsidiaries: Syngene in 1994 and Clinigene in the year 2000. In the year 1987; Narayanan Vaghul of ICICI Ventures (Industrial Credit and Investment Corporation of India) supported the creation of a venture capital fund of $250,000. This is when the company for the first time got a chance to expand its research and development efforts majorly. In 1989, Biocon became the first Indian biotech company to get funding from United States for proprietary technologies. In 1989, Unilever acquired Biocon Biochemicals of Ireland from Leslie Auchincloss. This enabled Biocon to establish global best practices and quality systems. In 1990, Biocon Biopharmaceuticals Private Limited (BBLP) was incorporated to manufacture and market a select range of bio-therapeutics. In 1997, Imperial Chemical Industries (ICI) bought the specialty chemicals division, including Biocon from Unilever. In 1998, Kiran’s fiancé, John Shaw personally raised $2 million to purchase the outstanding Biocon shares from ICI because Unilever, a major shareholder, disagreed on Kiran’s decision to focus on biopharmaceuticals rather than enzymes. In 2001, John Shaw, the chairman at Madura Coats left his job to join Biocon as their new vice chairman. By 2003, Biocon became the first company in the world to develop human insulin on a Pichia expression system. In 2004, after seeking the advice of Narayana Murthy, Kiran listed Biocon on the stock market with intent to raise capital to be able to further develop Biocon’s research programs. It was the India’s first IPO of a biotechnology company. – Biocon became the second Indian company to cross the $1-billion mark on the first day of listing by closing with a market value of $1.11 billion. – And soon after it went public; the company’s revenue went straight up from Rs. 70 crore in 1998 to Rs. 500 crore. Henceforth there has been no looking back for Biocon or Kiran herself!!! In 2004, Kiran started a corporate social responsibility (CSR) wing at Biocon, the Biocon Foundation with focus on the areas of health, education and infrastructure. Clinics to offer clinical care, generic medicines and basic tests, & as of 2010, seven clinics serving a population of 50,000 patients living within a radius of 10 km, treating in total more than 300,000 people per year. ARY clinics also promote – ARY Health Insurance scheme (annual premium – INR 120/head) and the members of the Scheme get services such as free surgeries, consultation, medicines, tests and subsidized hospitalization at ARY clinics and other hospitals. The Foundation has built more than 800 toilets in Phase 1 of its sanitation program. Watching her best friend, husband and her mother suffer from cancer, motivated Kiran to strongly support cancer research & treatment. In 2009, she established a 1400-bed Mazumdar-Shaw cancer center, at the Narayana Health City campus. In 2011, a center for advanced therapeutics with a bone marrow transplant unit and a research center were added. To improve the infrastructure and standard of living of the city; Kiran has supported the initiative of S. M. Krishna and Nandan Nilekani called Bangalore Agenda Task Force. She is a part of the Bangalore City Connect Foundation, which discusses civic issues, involving both urban stakeholders and the government. Kiran is also involved in the Bangalore Political Action Committee (BPAC), which reviews and recommends candidates running in elections. And lastly after the floods 2009; Biocon, Infosys and Wipro committed to rebuild homes for flood victims in north Karnataka. Biocon committed to build 3,000 houses at a cost of INR 30 crore. Biocon Limited today is a Bombay stock exchange listed biopharmaceutical company based in Bangalore which primarily manufactures generic active pharmaceutical ingredients (APIs) and sells them in the developed markets of the United States and Europe. It also manufactures biosimilar Insulins and sells them domestically in India in both bulk and formulation forms as branded formulations. Biocon has two subsidiaries — Syngene International Limited (Syngene) provides customized research in & of every drug discovery while their other fully owned subsidiary — Clinigene International Limited (Clinigene) is into complete clinical development & research. To add to that; Biocon’s presence includes 4 main therapeutic areas — Diabetology, Cardiology, Nephrology and Oncology! Due to multiple mergers & acquisitions; Biocon’s net income took a big leap and increased by 44% to INR 24,048 million and profits grew by 215% to INR 2,933 million in 2009–10. Biocon including its both the subsidiaries – Syngene & Clinigene, caters to customers from over 75 countries and employs roughly 4,500 personnel which compromises of biologists, chemists, medical practitioners, pharmacologists, engineers, finance/legal/marketing analysts, HR generalists and general administrators. Biocon limited is looked upto with high respect and is considered to be amongst the top 20 leading biotechnology companies in the world and as of the list for 2013 by Science magazine; Biocon was ranked at No. 6 on the ‘Top 20 Biopharma Employers’. Biocon has very intelligently made its mark across the world not just by supplying their products globally but also by merging or acquiring firms. It, unlike many Indian pharmacological companies has directed about 8% of its revenue back into research & development and as a result of their research activity it also has filed more than 950 patent applications. Kiran has since beginning actively been a part of acquisitions, partnerships and in-licensing within the pharmaceuticals and bio-pharmaceutical area, and had entered into more than 2,200 high-value R&D licensing and other deals between 2005 and 2010. In 2003, the company established a joint venture with the Cuban institute CIMAB and named it – Biocon Biopharmaceuticals Pvt. Ltd. (BBPL). In 2004, they initiated a partnership with their US antibody technology partner, Vaccinex and are also developing fully human antibodies BVX 10 and BVX-20. In 2007, the company entered into an agreement with Abraxis BioScience, Inc. which helped Biocon out-license the rights to develop and market a biosimilar version of GCSF (Granulocyte Colony-Stimulating Factor) to North American and European markets. Biocon acquired a majority stake of 70% in one of Europe’s fastest German pharmaceutical marketing company – AxiCorp GmbH. Biocon established 50:50 joint-venture with the Abu Dhabi-based pharmaceutical manufacturing company – NeoPharma and named it, NeoBiocon FZ LLC which is a research and marketing pharmaceutical company based in Abu Dhabi. Biocon entered into a strategic partnership to co-develop an exclusive new class of immunoconjugates with United States based IATRICa. In 2009, Biocon collaborated with Mylan to develop and commercialize multiple, high-value generic biologics. Most of her dreams have come true in life and success is at her feet too! Today a whole book would also not be enough to fill in her achievements and contribution to the society. But what she misses the most is the normal life which many lead today, the fact that she got married only at the age of 44 and that her work was so important that she couldn’t even think about having children; pinches her sometimes. She doesn’t hold any regrets at all and considers all the pinches as a sacrifice which she had to make to be able to achieve all what she has so far.